An extract of Paul O’Flinn’s ‘Production and Reproduction: the case of Frankenstein’ is featured in The Horror Reader, edited by Ken Gelder. Having only recently read Mary Shelley’s Frankenstein for the first time I’ve been interested in how this monstrous character has morphed from being a damaged, repulsive, complex revenge-killer into a green, not responsible for his actions, somewhat lovable mute throughout popular culture; even so much as we now collectively associate the monster as “Frankenstein” when that name really belongs to the Doctor. This metamorphosis occurs through a shifting of mediums (from novel to film) and through a change in contemporary social climates; Frankenstein becomes a site of re-production and a mimetic vessel for each new time period. To me, this reflects the continuous and self-generative/reflexive nature of the horror genre itself all manifested in one big monster metaphor. 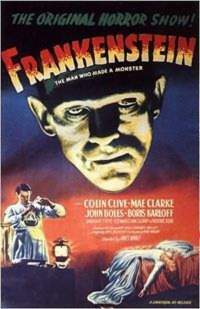 Three different kinds of shifts considered when looking at Mary Shelley’s book and the represented films (Frankenstein, 1931 with Boris Karloff by Universal and The Curse of Frankenstein with Christopher Lee by Hammer) concern: medium, audience, and content. For instance, Walton’s letters are necessarily omitted from the film versions.